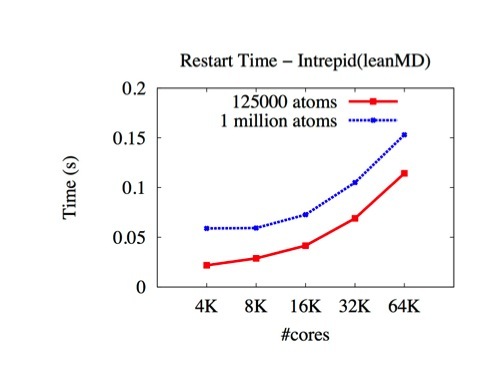 As both modern supercomputers and new generation scientific computing applications grow in size and complexity, the probability of system failure rises commensurately. Making parallel computing fault tolerant has become an increasingly important issue. At PPL, we have research (and resultant software) on multiple schemes that support fault tolerance:(1) automated traditional checkpoint with restart on a different number of processors (2) an in-remote-memory (or in-local-disk) double checkpointing scheme for online fault recovery (3) an ongoing research project that avoids sending all processors back to their checkpoints, and speeds up restart (4) a proactive fault avoidance scheme that evacuates a processor while letting the computation continue. On-disk checkpoint/restart is the simplest approach. It requires synchronization in the system. In AMPI, this is invoked by a collective call. All the data is saved as disk files on a file server. When a processor crashes, the application is killed and then restarted from its checkpoint. This approach allows the scheduler more flexibility, since a job can be restarted on a different number of processors. Double checkpoint-based fault tolerance for Charm++ and AMPI. provides fast and efficient checkpoint and restart using memory for checkpointing. It can take advantage of high performance network to speedup checkpointing process. at restart, it provides fault tolerance support for both cases with or without backup processors. If there are no backup processors, the program can continue to run on the remaining processors without performance penalty due to load imbalance. the memory-based method is useful for applications where the memory footprint is small at the checkpoint state, while a variation of this scheme --- in-disk checkpoint/restart can be applied to applications with large memory footprint. It uses local scratch disk for storing checkpoints, which is much more efficient than using centralized reliable file server. provides asynchronous checkpointing support for applications have moderate checkpoint size to relieve the network pressure. There are two phases in the support. In the first phase, after reaching a global synchronization point, each node will store its checkpoint in the main memory. After every node safely stores the newest copy of the checkpoint, they will resume to the normal execution. Then, the Charm++ runtime system will take the responsibility to send the checkpoints of each node to another node as a double copy at the appropriate time: when the applications are busy computing and leave the network free. 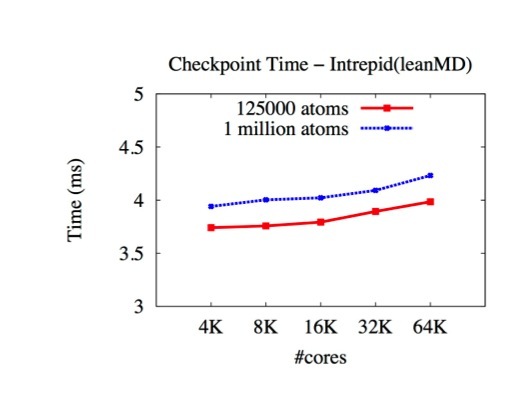 The checkpoint and restart time of the leanmd benchmark is shown below (on BG/P intrepid). It runs well and could scale to 32K cores. 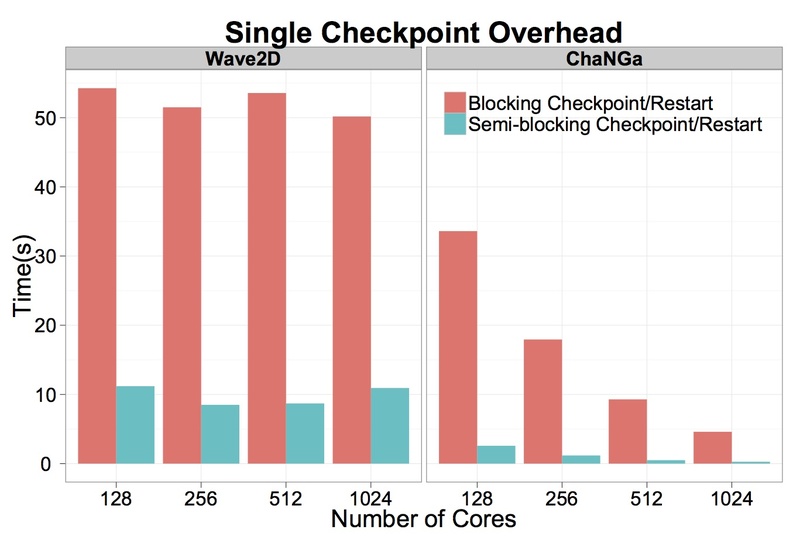 For applications (wave2D and ChaNGa) uses asynchronous checkpointing, the checkpoint time is further reduced as shown below (on Trestles). FTL-Charm++:is a sender based pessimistic fault tolerant protocol for Charm++ and AMPI. The sender saves a copy of the message in its memory while sending a message to an object on another processor. It sends a ticket request to the receiver, which replies with a ticket. A ticket is the sequence in which the receiver will process this message. The sender saves the ticket in its memory and sends the message to the receiver. For messages sent to an object on the same processor, the ticket number is fetched through a function call and along with the sender and receiver's id is saved on a buddy processor. This allows message logging to work along with virtualization. While restarting after a crash, this protocol can spread the objects on the restarted processor among other processors. This provides for much faster restarts compared to other message logging protocols where all the work of the restarted processor is done on one processor. Checkpoint based protocols, which rollback all processors to their previous checkpoint when one processor crashes, obviously cannot redistribute work from the restarted processor as all processors are busy. So our protocol is unique in allowing restarts much faster than the time between the crash and the previous checkpoint. Work is going on to combine the message logging protocol with migration of objects to allow us to do dynamic runtime load balancing. Proactive Fault Tolerance: is a scheme for reacting to fault warnings for Charm++ and AMPI. Modern hardware and fault prediction schemes can predict many faults with a good degree of accuracy. We developed a scheme for reacting to such faults. When a node is warned that it might crash, the charm++ objects on it are migrated away. The runtime system is also changed so that message delivery can continue seamlessly even if the warned node crashes. Reduction trees are also modified to remove the warned node from the tree so that its crash does not cause the tree to become disconnected. A node in the tree is replaced by one of its children. If the tree becomes too unbalanced, the whole reduction tree can be recreated from scratch. The proactive fault tolerance protocol does not require any extra nodes, it continues working on the remaining ones. It can deal with multiple simultaneous warnings, which is useful for real life cases where all the nodes in a rack are about to go down. Below we show a run of NPB BT-MZ on 256 cores of Ranger with proactive fault tolerance support. 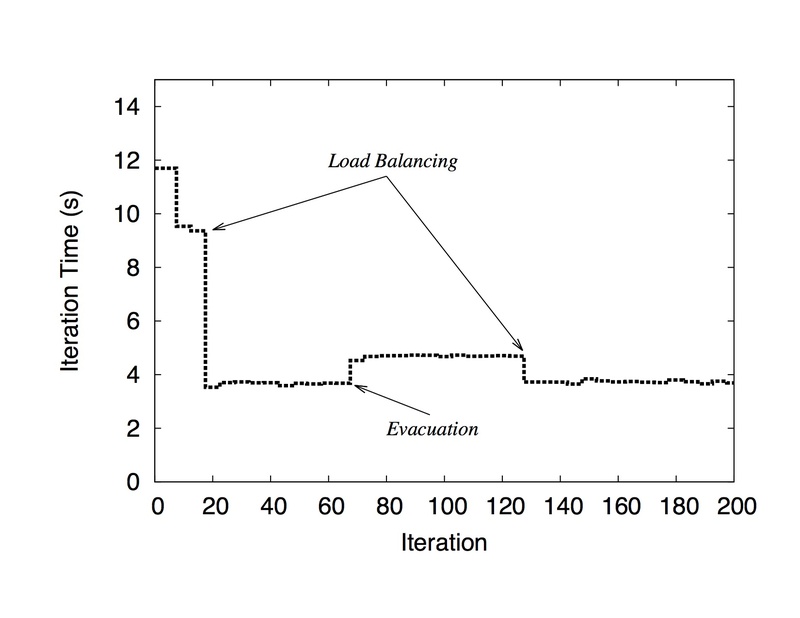 The first load balancing at iteration 20 solves the initial load imbalancing of the application. At iteration 60, one core receives the signal of failure and objects on it migrate to other cores which creates a load imbalancing in the system. The problem is solved by applying load balancing once more.